The Haute-Savoie has long been on France's frontier. It was formed in 1860 out of the old provinces of the Genevois, the Chablais and the Faucigny. The department has a beautiful natural landscape making it a top destination for tourists. At the same time, due to its strategic positioning at the heart of Europe, it has a rapidly developing economy. The department also has the fastest growing population in the Rhône-Alpes. More than a third of the inhabitants are under 25. While most of the Haute-Savoie's tourist industry has sprung up since the 1950s, the department first became a major tourist destination back in the 18th century. At that time it was mostly visited by the English who came to admire the glaciers. 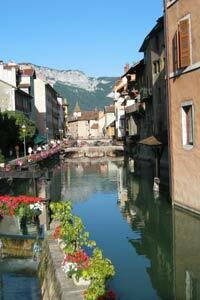 Annecy is the fashionable and friendly capital of the Haute-Savoie department. The town's canals give it a sense of romance and it can, quite justifiably, be compared with Venice. The latter does not, however, have the magnificent French Alps bearing down upon it. 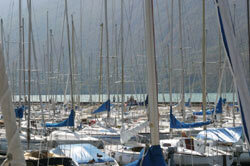 Annecy also has a 15km long lake by the same name at its edge making it a great base for water sports. When you've exhausted the water-based activities, you can hike, glide or cycle through the beautiful scenery. To the north of the department, beside Lake Geneva, you will come across Thonon-Les-Bains. This medieval stone village has its own port and is a great place to base yourself for activities on the lake. Just to the east you will find Evian, famed for its springs. It's possible to visit the factory where the water is bottled and sent around the world. There's a lot of choice when it comes to flying to the Haute-Savoie. British Airways and Air France fly to Lyon and Geneva, just over the Swiss border. On top of this there are a host of budget airlines making the trip to the French Alps. An alternative airport to consider is Chambéry. Annecy is a one-hour drive from Geneva in Switzerland and a two-hour drive from Lyon. If taking to the skies is not for you then there is an easy alternative. The TGV service will take you all the way to Grenoble or Lyon from the Channel Tunnel (changing at Paris) in comfort and speed. Or there is a weekly rail service from London St Pancras to Geneva, taking just over eight hours. Property prices in the department are high, mainly due to the strong rental market. Despite the fact that Megeve is located lower down the slopes and sees less snow than most other resorts in the French Alps, interest in renting here is still high even in the summer due to its golf course and many restaurants. Do you know Haute-Savoie better than we do? Do you have photos of Haute-Savoie? The department of Haute-Savoie is located in the far east of the Rhône-Alpes region.